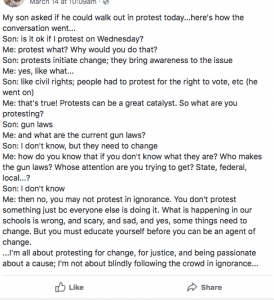 Many children who marched for gun-control didn't even know what the rally was for. It's not their fault, because they are, well kids. Does anyone believe 13-year-olds understand the complexities of constitutional rights, legislation and how the legislative branch operates? Are there really two sides to every story? 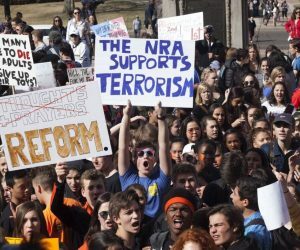 If you watched the media's coverage of the #Enough Nationwide School Walkout that occurred March 15th, you would have seen the youth of our nation marching in unison to protest gun violence. 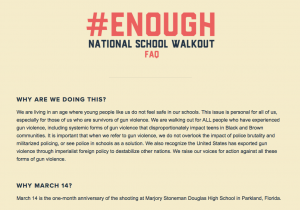 The power of the event, organized under the hashtag #Enough, was so compelling that senators, mayors, school administrators, teachers, etc. joined in various ways. Some media coverage said the walkout was a memorial to the 17 lives lost in the Parkland school shooting. Other headlines indicated that it was to push the legislature to act on gun control legislation. The chants and signs from the crowd indicated that in part it was a protest against the NRA's stance on the gun issues, and President Trump not banning assault weapons during his first year in office. It seemed like a mixed bag, but there had to be a group that organized the event right? No doubt, many agree with some of the chants and signs coming from the marchers. But is it a belief based on facts? We are living in an age where young people like us do not feel safe in our schools. This issue is personal for all of us, especially for those of us who are survivors of gun violence. We are walking out for ALL people who have experienced gun violence, including systemic forms of gun violence that disproportionately impact teens in Black and Brown communities. It is important that when we refer to gun violence, we do not overlook the impact of police brutality and militarized policing, or see police in schools as a solution. We also recognize the United States has exported gun violence through imperialist foreign policy to destabilize other nations. We raise our voices for action against all these forms of gun violence. This is the purpose of the march as stated on the website of the group that organized the event. Huh? Wait a second. This is what school administers were allowing children to go to instead of being in school? This is the cause politicians and teachers are supporting? Maybe the kids didn't know exactly the political agenda the group has in addition to honoring 17 lives lost. But the school administration had to have researched an event that they were allowing kids to go to. After all, they were going to these events during school time, so it would have to be a school approved event, right? Teachers and administrators sanctioned using tax-funded school time and resources to remove kids from school in support of stopping “…police brutality and militarized policing” and the belief that “…the United States has exported gun violence through imperialist foreign policy to destabilize other nations.” Did the parents and school staff know the real purpose of the event and still believe it a worthy enough cause to have their children rally for? I don't know, but perhaps in the zeal to intertwine political opinions with the school curriculum, the school administrators overlooked some basic checks and balances. I would imagine if students were taken on a field trip to a museum, students wouldn't end up at the Museum of Holocost Deniers because organizers failed to do research on what the museum was about. So who dropped the ball across the country in vetting the organization behind the event? Was the ball dropped or has the educational process really become so political as to support an organization that lists one of its partners as the Democratic Socialists of America? 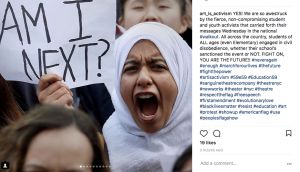 Using children as activists for political means is wrong, even if you think the cause is just. More than half of the supporters of the Women's March organization have a clear, one-sided, political stance and agenda. If this type of organization is allowed to organize an event for which administrators will excuse students to attend, would a group of far right-wing political ideologies be able to do the same? Both are abhorrent and have no place in school. Parents should be the ones making the decisions about what events their juvenile children attend. For this reason, and a host of others, theatrical, politically driven stunts should never take place in grade schools. School administrators should not facilitate these events. It is not the forum and that is not their role. 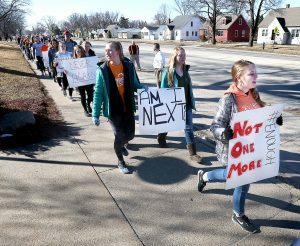 In the article, Aftershock of the Gun Control School Walkout, I document several stories of kids who were on the ‘wrong side' of the event, and the effect it had on them. I also document instances where kids were taken out of class to participate in the march, without the parents' consent, even after being told that their child's school would not participate in the event. I caution parents who don't think this is a big deal because this happens to be a cause they can get behind. 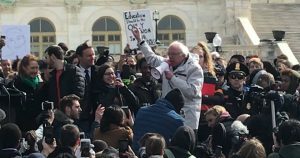 Bernie Sanders joined the #Enough marchers in demanding legislation prohibiting magazines that hold more than 10 rounds get passed. Ironic because Bernie didn't feel safe enough to attend a gun-control rally filled with juveniles, without his armed security detail. Who were armed with handguns with magazines holding more than 10 rounds. Would they be subject to the proposed legislation? I for one will be at my city's next school board meeting, asking if administrators knew about the political agenda of the group organizing the march. And if so, do they agree with the organization's core principles. And finally where they get off circumventing parents rights to choose what types of events grade school students attend. This is how you keep your child from being used by politicians and the media. This march should have been about a desist of the political manipulations, a focus on passing gun laws that protect children, solutions to make schools safer, and holding accountable the FBI and police officers who failed to protect the 17 lives that were recently lost. Does anyone else see that the rally was a political stunt, where kids were manipulated by adults like political props? No doubt, there are kids who truly think gun control will make them safer and there are kids who disagree with the stance. The commonality between the two groups is that those opinions likely were influenced by what they hear from adults. Because kids are so easily influenced, lessons on monumental and sensitive topics like these should be the parents' jurisdiction, not that of Women's March. 5 Responses to Has it Become Acceptable to Exploit Children? Wow, that’s the best you could do to put down these brave young men and women ? All powder and wad. Nothing that shoots straight. What is brave about parading around for the cameras and the media that will silence anyone who disagrees with them? Being a pawn for the anti-gun media is not brave. Protesting to take the rights from law-abiding citizens is not brave. These young men and women have virtually no resistance and anyone who questions them is shouted down and called names. This takes no bravery. The men and women who fight for this country are brave, the men and women who fought for civil rights were brave, these children are pampered and entitled. Fully agree with the author. I’m so sick and tired of this endless manipulation by the media and the politicians who dream about taking our 2nd ammendment away little by little. Leave a Reply to Matt Preti Click here to cancel reply.